The heart of the PARATROOPER is built on our famous BAD-PDW Monolithic PDW Lower Receiver & VERT Stock System with Ambidextrous Controls. It is chambered in .300BLK with a 7.5in barrel shrouded in 6.7in RIGIDRAIL M-LOK free float rail system and has an overall length of 20.1in. 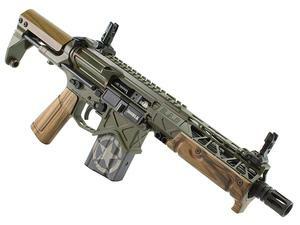 It is built as a factory SBR (Short Barrel Rifle) so all NFA rules apply. Barrel Battle Arms 7.5" 4150 CM Barrel, tapered profile, .750" Dia. Gas Block Journal, Pistol Length Gas System, .300BLK Cal., 5R Rifling, 1/8 Right Hand Twist, Black Nitride Finish, Double Stress Relieved, 5/8x24 Threaded Muzzle, 11° Target Crown. Gas Block Ti-750 - Titanium Gas Block .750" Dia. Furniture Grade A French Walnut Handguard & Pistol Grip with Custom Mounting Hardware. Simulated Wood SS Cheek Rest. Finish CUSTOM CERAKOTE, WWII "Parkerized Green Steel and Cosmoline" Themed Finish. This item has to be shipped to a licensed class III dealer. All NFA rules apply.